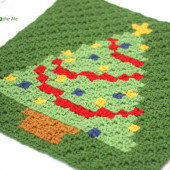 A cross between a pixel blanket and a graphgan, this bobble stitch acts as a pixel square, but like a graphgan, is crocheted in rows. No joining! 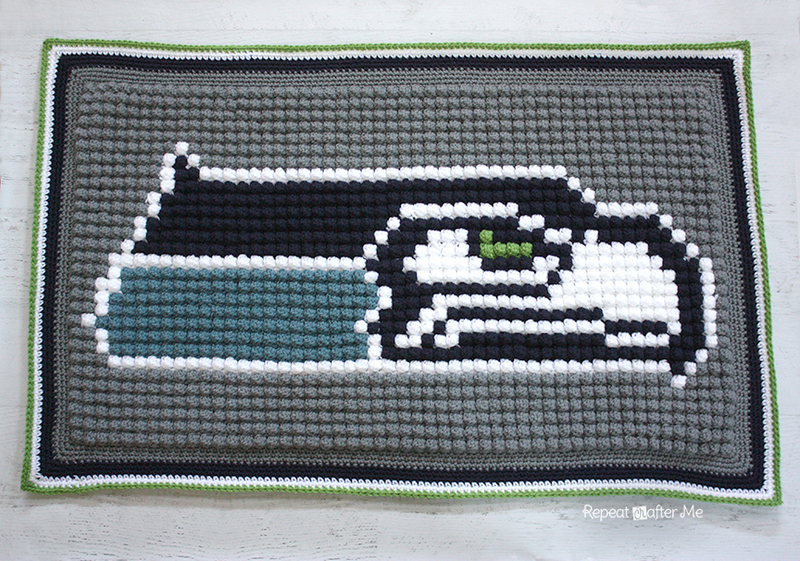 I am from Seattle and we are huge fans of the Seattle Seahawks so I made this one for my oldest son. It took me about a week to make and it measure approx 42 x 27 inches. My graph has 51 squares across and 29 squares down. Just like any pixel blanket, perler bead patterns make perfect pixel graphs. 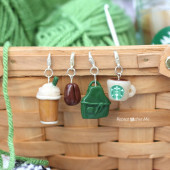 Kandi Patterns is a great place for you to start looking for one! 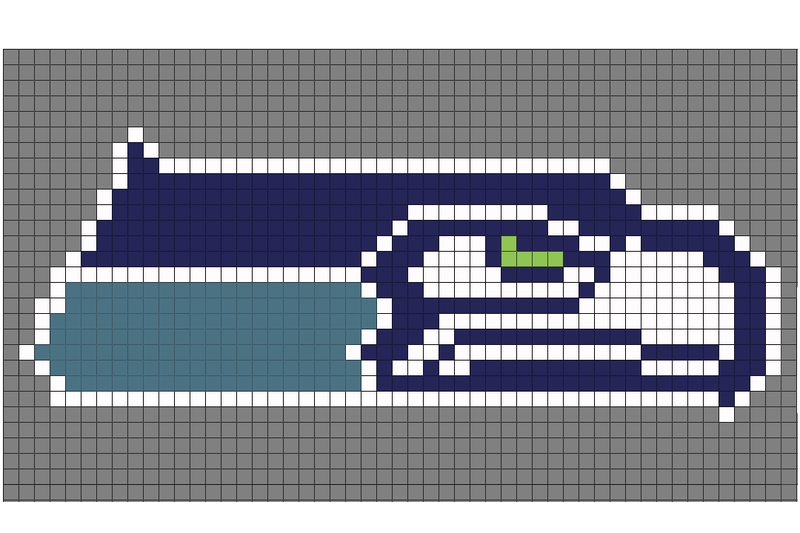 If you are also a Seahawks fan, you can download and print the graph I used HERE. 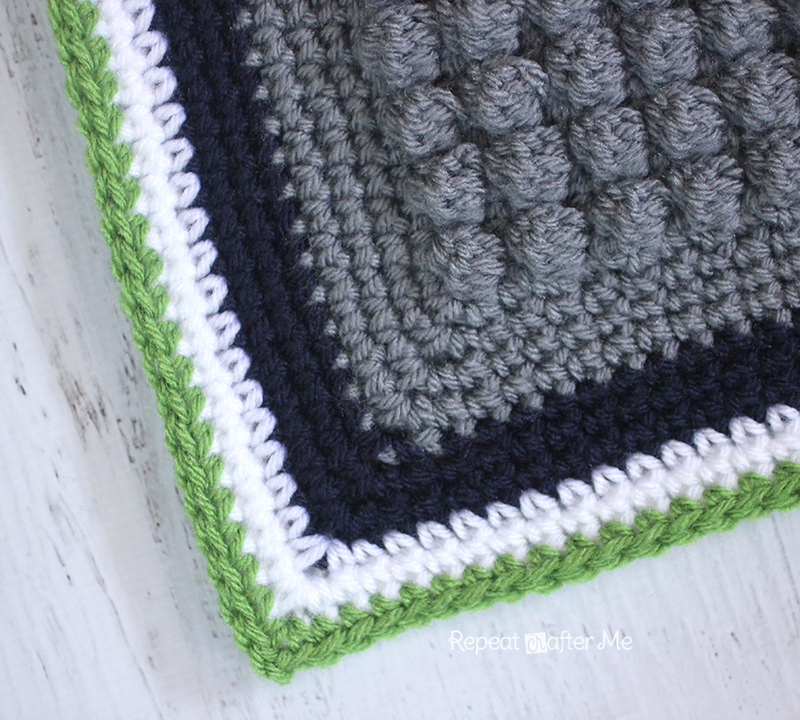 Now let me tell you how to crochet a bobble stitch pixel blanket! – Worsted weight yarn. I used Lion Brand Vanna’s choice in Silver Grey, Dusty Blue, Navy, White, and Fern Green. I used about 4 skeins of grey, 2 skeins of navy, 1 skein of dusty blue and fern green, and 2 skeins of white. 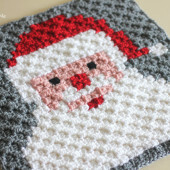 The blanket is made up of one row of bobble stitches plus single crochets and then a row of just single crochets. 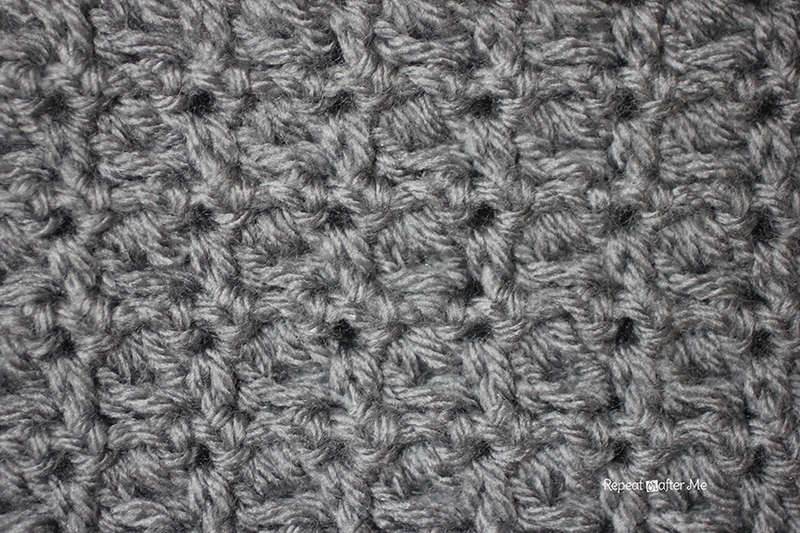 In my mind each pixel square is made up of one bobble stitch + SC and then two single crochets under that. Here is a quick video on how to make a bobble stitch! Your starting chain will be the number of squares across your graph, doubled, plus one. 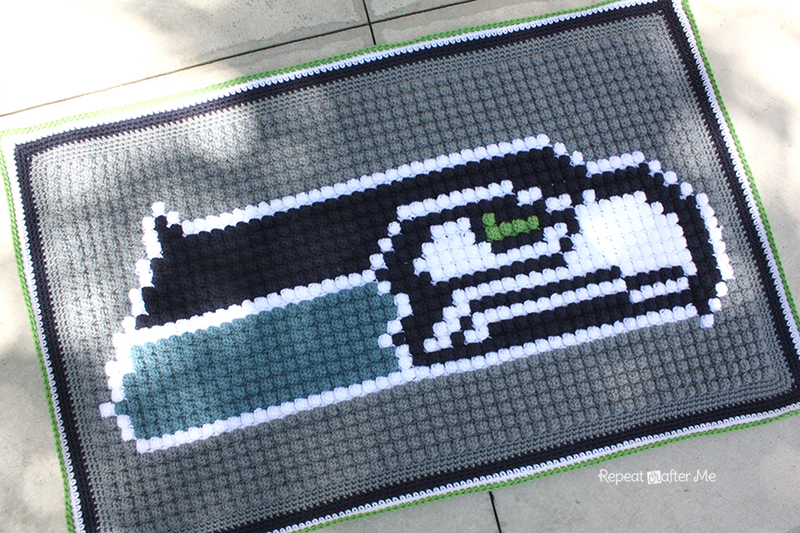 So there are 51 squares going across my Seahawks graph so my starting chain was 103. SC in second chain from hook and SC down the entire chain. Chain 3 and turn. Continue this pattern making sure to change color yarn by following your graph. Like I mentioned above, each “pixel” is a bobble + SC and then two SC underneath so the SC stitches underneath will have to match the color of the bobble above it. Below are two videos on how I make color changes. 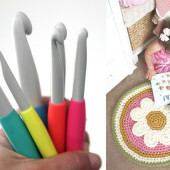 Try to carry your yarn over by crocheting stitches over one or two colors… making it easy to pick them up again. I also had success with leave loose end strands long and then carry them up a row. If they sit close enough to the bobble, you can’t even tell there is a bit of extra yarn there. 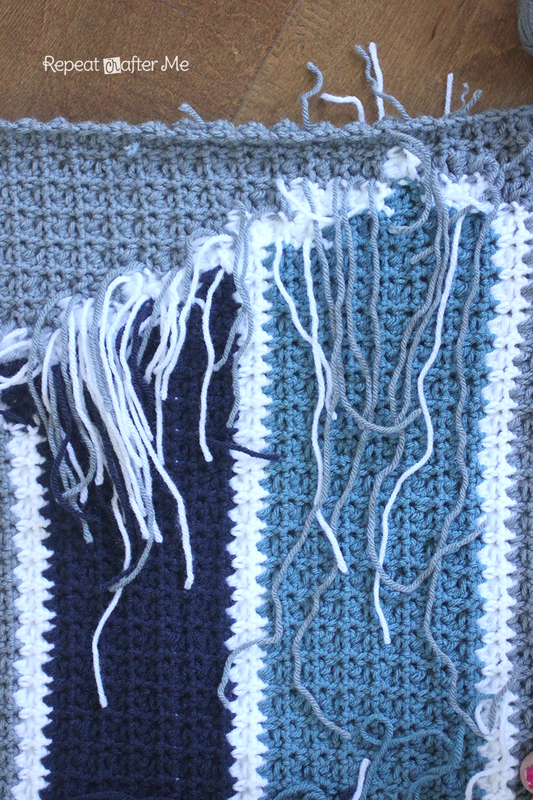 As you can see in the picture below I struggled with color changes on the left hand side (beginning part of the blanket) but once I got into the swing of things I had less loose ends by the second half of the project. I made a simple SC border around my blanket. 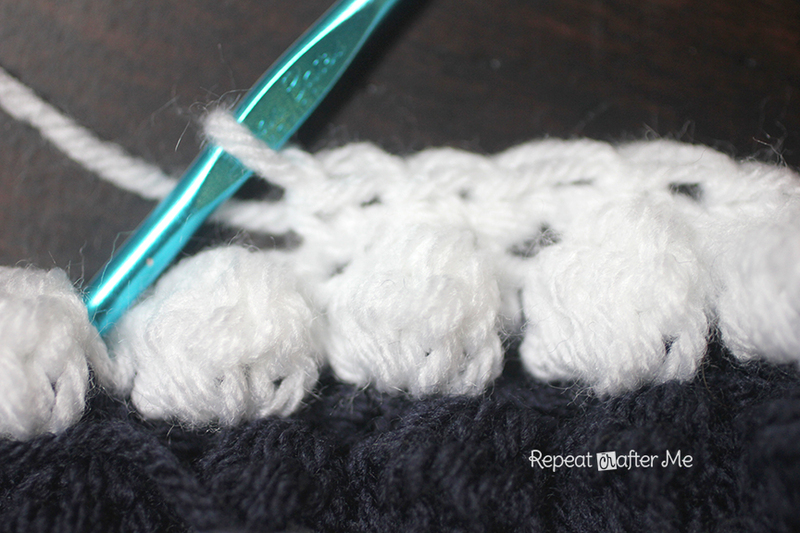 On the first round of your border make sure you are only make 2 SC per bobble… especially along the rough edges. Extra SC stitches will make the edging ripple. At each corner you will SC + chain 2 + SC in one stitch. The first 4 rounds are silver gray, then 3 rounds of navy, 2 rounds of white, and one round of green. Oh and of course you all want to know what the back looks like! The textures in this blanket are wonderful! I have a happy 12th man! 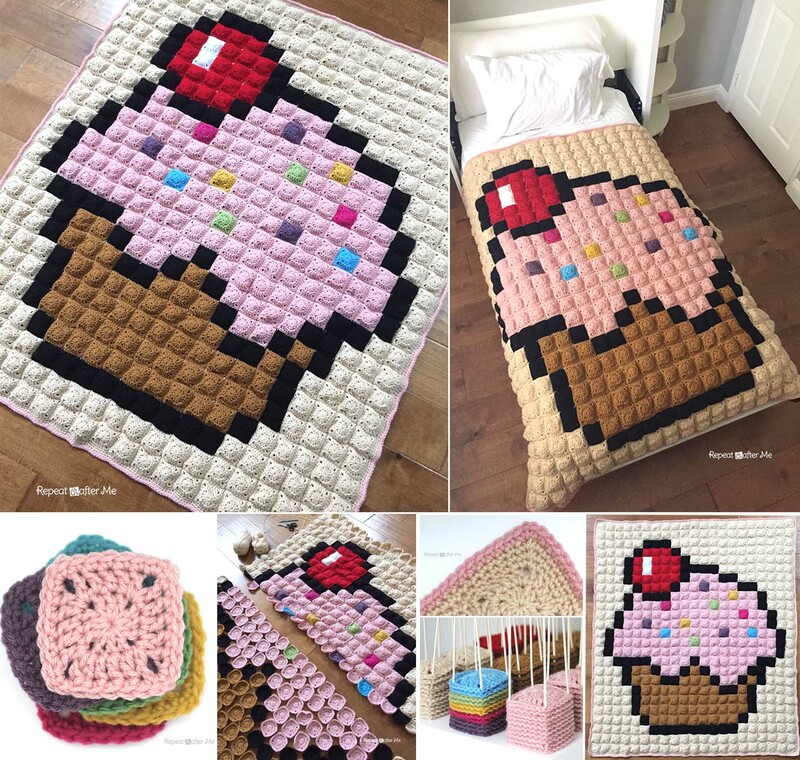 If you like this you might like my Cupcake Pixel Blanket! I absolutely LOVE this! We are in Mississippi, but my husband is from Seattle originally and is a huge Seahawks fan. I've never used a graph for a pattern, but I am going to attempt to make one before football season starts back up. I will just add more rows to the borders so the blanket is big enough for him. 🙂 Thank you so much for sharing! what do you do with the strands on the back? honey, you have mad skills!!!! i love your photos and your patterns – thanks for sharing! This is absolutely awesome! 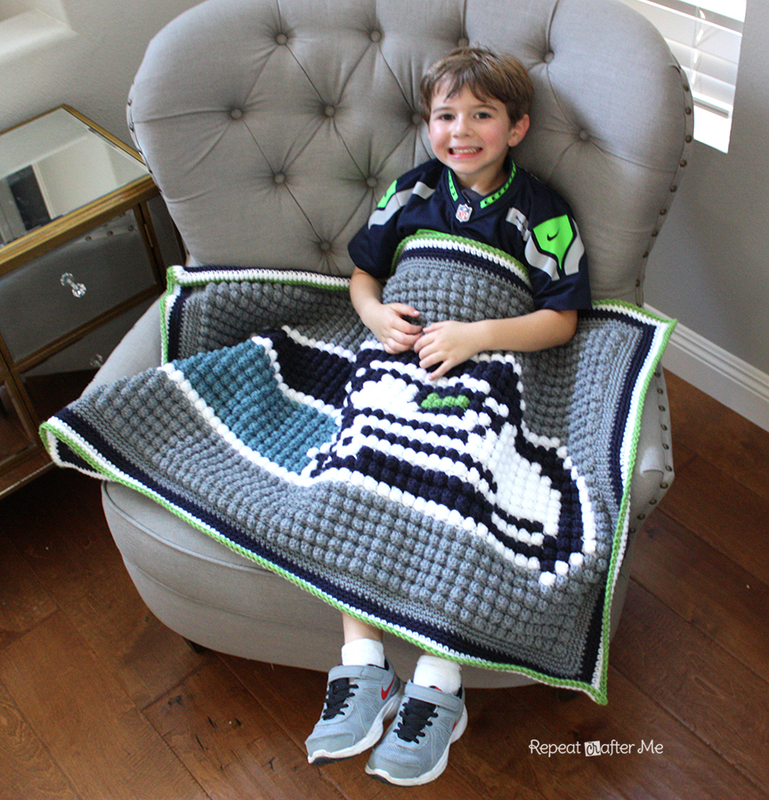 But how can I crochet the picture bigger so that I get a larger blanket? Im about to attempt a hello kitty bobble blanket AND a pixel square version if my 2 toddlers allow me. Never mind, I read your post about the pixel blanket. Since I can't adjust the size without distorting the image,I will just make regular granny squares which should result in a bigger blanket. This is way better than a brick & mortar esbntlishmeat. Love it! Now I am going to have to find a Tennessee Titans graph! This site has all teams! Sweet! They have Carolina Panthers! The pucshares I make are entirely based on these articles. love this… I started a penn state graph-ghan for my mother in law last year and had a horrible time. I frogged it too many times to count…I started this yesterday and am a quarter of the way done already. thank you sooo much!! Wow, you are so fast!! 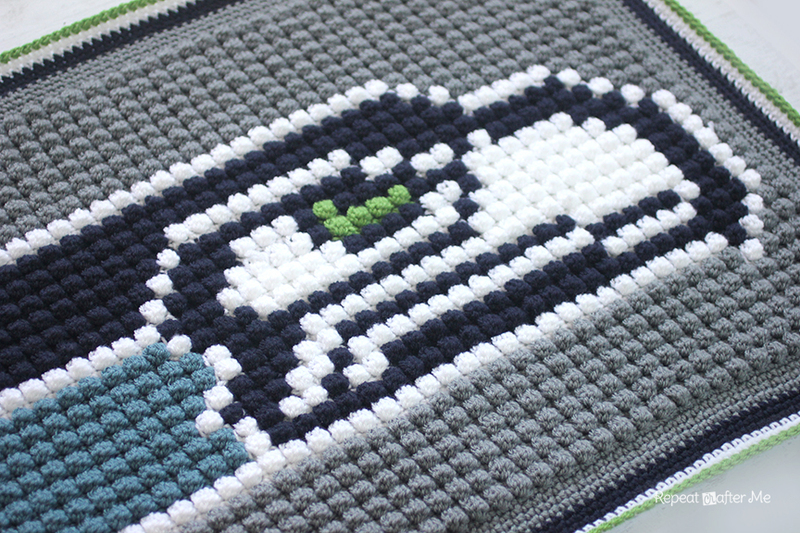 Love the look of this blanket, I'm really wanting to try a graphgan soon. Beautiful work! This is a great boys blanket. Thanks for the clear videos and for the pattern. That’s so awesome! It looks so cool with the bobble stitches. Amazing work! I'd love to try something like this. Thank you for sharing! That is so very cool! Thanks for sharing the pattern! GO HAWKS! This is awesome! (and since I *hate* seaming, perfect!) I'll have to do this, I think. I feel PRETTY foolish asking this.. But did you flip the original graph, or did you crochet it left to right.. For some reason I can't make sense of that so was doing mine right to left, and it's the team name so its backwards when I flip it over! I am almost finished with mine and realised mine is backwards. I am not figure out how I did that lol, did you figure out how to flip it? 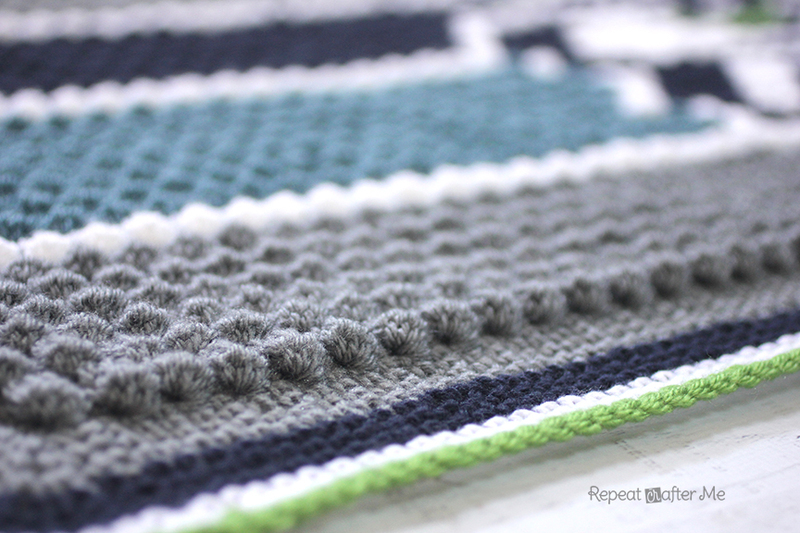 I was wondering if I could get specific instructions on the border – Rows 1 and 2 of the single crochet border. I am having trouble figuring this out for some reason?? I am just about finished my bobbles and getting ready to start the border on my project and could use a little clarification, please. In the first round you say to do 2 sc in each bobble. Does that mean you're doing 3 sc for each square on the graph (bobble + sc = square), or just 2? I've put so much work into this project so far I don't want to mess it up now! Wow these are proffessional looking! I am inspired! Love the Snoopy one! Now I am going to have to attempt this! It makes a beautiful afghan! So impressed! I currently live in Denver but I'm from Seattle and I'm a HUGE Seahawks fan! I absolutely LOVE this! I hope one day I'm as good as you! I'm getting there! This is by far my favorite crochet page! This is so awesome! Thanks so much for sharing! Just found your site and al the COOL stuff. 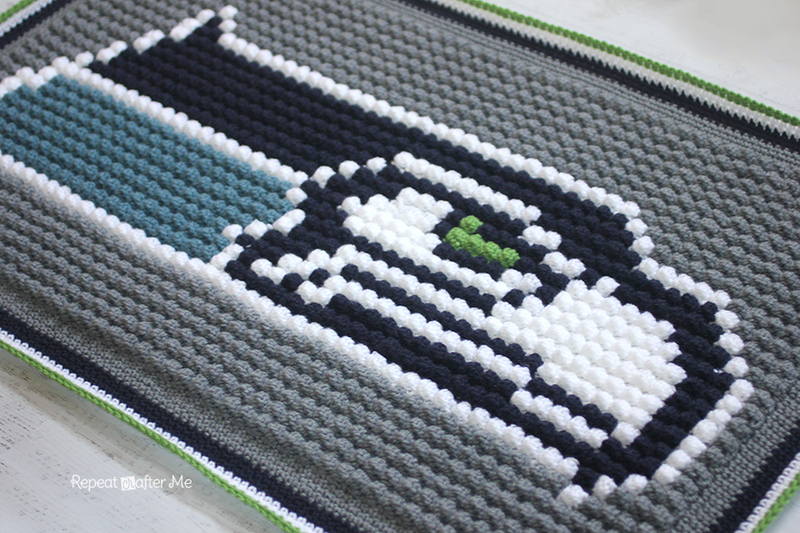 OMG, OMG, OMG…..a Seahawk blanket! You must be my neighbor if you’re in the PNW. Just started a hello kitty blanket for my daughter. Thanks for the great instructions!!! Thanks Sarah. Going to try the robot graph I found today and these instructions will help. Hope the newbee is doing well! a good start. then remove him from the bench. then disbar him. and then nicolai should be arrested and inreecrcatad for a long time. this man nicolai has ruined many families. he’s garbage. Glenn W – yeah, everyone should be packing heat when observing their religious rites and their religious institution of choice! Why didn't I think of THAT?So Graham, if twelve lefties kill someone and one righty does, is the righty absolved and forgiven, even glorified for his or her crime? When doing the edging, do you just do 2sc per bobble, and ignore the sc row between bobble rows? I did one row of bobble like you said and the next is SC. Does that count as a row on my graph? The SC row. Hi I am making a similar blanket for my Mum as a present. Thanks for the advise about the edging – now I have a plan. I was just wondering did you block this blanket and how? So are you supposed to do two rows of sc between each row of bobbles? It’s only 1 row of sc! Any chance you’ll be revisiting this as a C2C graph? I actually have almost finished this as a C2C. I have 7 more rows of C2C to go as I ran out of yarn. I started it previously as she described and just didn’t like the way it was working for me. switched to this and it was a breeze. I may line the back with fabric as my back does not look as pretty as hers. Hi! 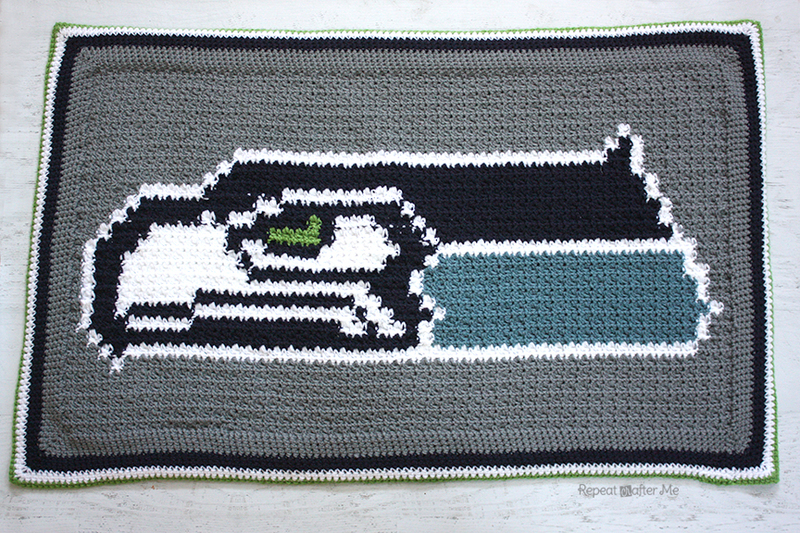 I’m making this for my cousin and his soon-to-be-born baby (they live in Seattle!). I was wondering if you started the pattern from the top-left of the graph or the bottom-right. I really hope you will reply back! Love this pattern. Do you think it would work the same way if I just wanted the central character on the graph bobbled.